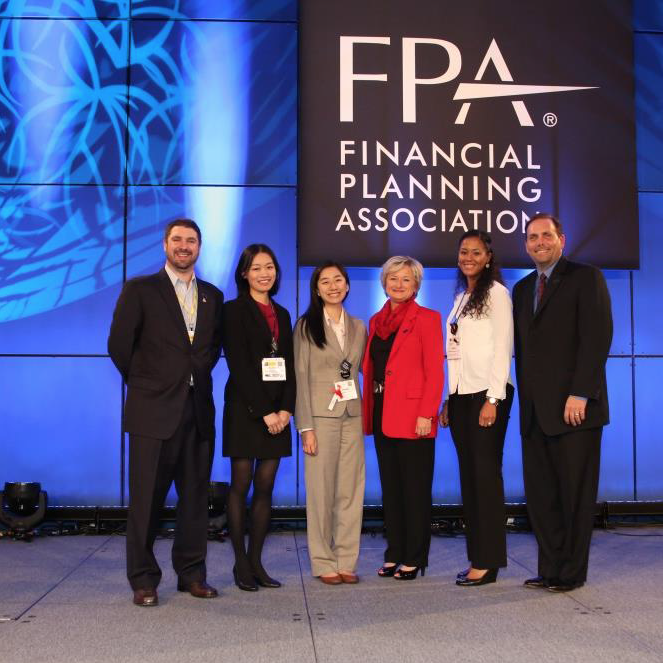 Phuong Luong, a Financial Coaching Associate in our Cambridge program, was recently awarded a scholarship to attend the Financial Planning Association’s (FPA) National Conference in Seattle, Washington. In addition to providing individualized financial coaching to Compass clients in Cambridge, Phuong is currently preparing to sit for the CERTIFIED FINANCIAL PLANNERTM Certification Examination. Read her reflection below to learn about her experience at the conference and the opportunities she sees for Compass and organizations like the FPA to work together to serve more low-income families in Massachusetts. Compass Financial Coaching Associate Phuong Luong (third from left) with FPA President Janet Stanzak (third from right), FPA leadership, and fellow Diversity Scholars. The Financial Planning Association (FPA) Annual Conference is the largest gathering of CERTIFIED FINANCIAL PLANNER™ professionals in the world. I was fortunate to be awarded the FPA Diversity Scholarship for planners who serve diverse communities or come from diverse communities themselves. The FPA Diversity Scholarship paid for all of my registration fees, travel, and accommodations. In my scholarship application, I discussed my enthusiasm for my work as a Financial Coaching Associate with Compass Working Capital, a non-profit that since 2005 has provided financial education, individualized financial coaching, and savings incentives to over 800 low-income families in metropolitan Boston, Cambridge, and Lynn, Massachusetts. Through these programs, Compass clients have built savings, decreased their debt, and worked towards financial goals like owning a home, saving for their children’s education, or starting a business. to health care, Social Security, cash flow management, retirement, and estate planning. There were events scheduled throughout the whole day including lunch time Knowledge Circles where participants could join discussions to elevate their practice. In addition, being named and recognized as a Diversity Scholar during the opening general session led many attendees from diverse communities to introduce themselves to me throughout the weekend. My fellow Diversity Scholarship winners, Rianka Dorsainvil, CFP® and Scarlett Che, CFP®, inspired me with their personal stories and commitment to our profession. I was surprised and heartened by the diversity of cultures, genders, ages, and perspectives I found represented at the conference and in our financial planning community. During the conference, I also learned more about the strong partnership between the FPA and The Foundation for Financial Planning, a national non-profit organization that connects populations that typically do not have access to quality financial guidance to CFP® professionals who can then provide pro-bono services. I am proud to be a member of the FPA, an association that does so much to foster diversity within its membership and that encourages its members to share the skills of the financial planning profession with the underserved. I left the conference inspired to get more involved with the FPA and my local FPA MA Chapter. I am motivated to find ways for Compass Working Capital and the Financial Planning Association to collaborate in the future, by contributing to the planning efforts of future events and conferences, bringing in speakers to contribute to the professional development of our membership, or by creating another pathway for CFP® professionals who want to translate their expertise in advanced financial planning topics to benefit low-income families. Next year’s 2015 FPA Annual Conference will take place right here in our hometown of Boston! I’ll be there and so will my colleagues from Compass Working Capital. We can’t wait to see you there. Download and print this Announcement and Essay by Phuong Luong.